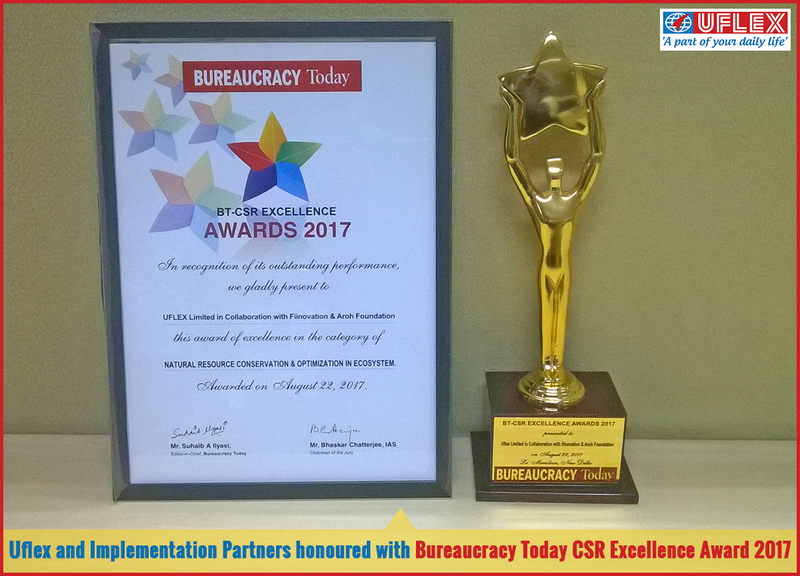 In a packed to capacity auditorium at Le Meridian New Delhi,with influential personalities from the Government and Corporate sectors, including Union Ministers, Ambassadors, Corporate Honchos, MPs, Senior Secretaries, Top Bureaucrats in attendance, Uflex Limited in association with its implementation partners Fiinovation and AROH Foundation was conferred with the Bureaucracy Today CSR Excellence Award 2017 for its Environmental Sustainability intervention “Conservation of Natural Resources and Optimization of Ecosystem”. Notably the Flexible Packaging behemoth has rolled out its Environmental Sustainability initiatives in a few villages of Gautam Buddha Nagar District of Uttar Pradesh and one village in Bhind District of Madhya Pradesh with an overarching goal of capacity building of the community to conserve and optimize the natural resource base through ex-situ rainwater harvesting and tree plantation adopting the Participatory Rural Appraisal methodology. Special emphasis is laid on community training and sensitization for school children and other rural stake holders for judicious and responsible use of natural resources.